Locker Group’s Atmosphere system is a time-efficient solution to the need for an effective and visually-striking facade. Saving clients effort and money, Atmosphere can provide solar shading and visual screening, and are a seamless way of fulfilling a striking design intent. Locker Group’s Atmosphere facade panels come in a range of design options, with answers to any client’s architectural specifications. The patent-protected Atmosphere system includes a variety of panel design choices which are installed on tensioned stainless steel cables. Our engineering team tailor each installation to project requirements, taking building location and orientation into account. Panels are delivered to site, ready for fast installation, whether panels cover the entire building face or are spread sporadically. Our wide range provides a mix of architectural solutions, with guidance from our expert team on the best use for your façade. Panel perforations can provide sun shading, while also encouraging airflow and allowing natural light through. Using them as a total façade makes for excellent protection from weather conditions year-round, while sporadic installation encourages a striking visual appeal that will get heads turning. Façade shape and profile also play a role, with ridged panels an alternative way of achieving an interesting architectural look when steel cables aren’t suited. Ridged panels still prevent the pooling of water and provide partial shading from the sun. 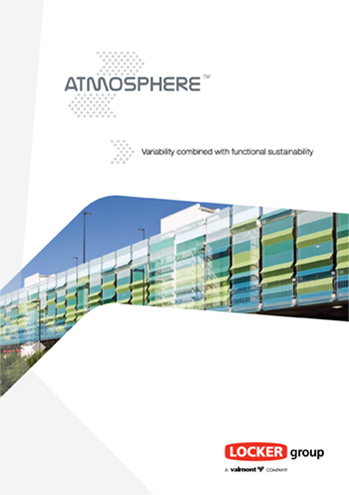 Atmosphere facades have been used in a plethora of architectural and construction projects of late, with their surge in popularity rooted in their ease of installation. They are most commonly used for screening open areas like car parks, or for providing sun shading while maintaining an open-air feel that doesn’t impair vision when looking through the panels. Their application provides an energy efficient solution to maintaining a comfortable temperature on the inside of structures while minimizing the requirement for mechanical ventilation. These architectural facades have been used on structures throughout Australia by clients who wanted paneling that worked as effectively as it looked. 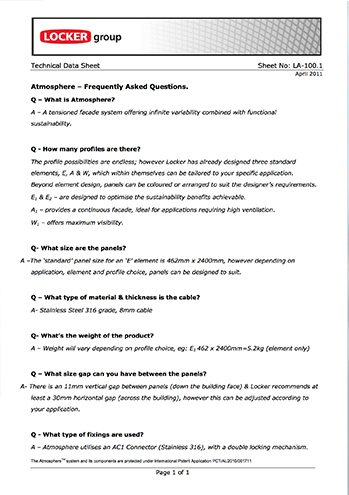 Examples of Atmosphere’s uses are available on our Project Gallery page. Park Beach Plaza and North Shore Hospital in New South Wales are just two other examples of where our Atmosphere facades have been used. They installed them on the exterior of their car parking buildings, with the installation finished quickly and easily to give patrons of these establishments comfortable sun shading and screening. For more information on our architectural range of Atmosphere architectural facades, contact our expert team today and find out how these architectural panels can contribute to your next project. The following data is based on analysis of the E1 panel, as performed by GHD, based on a typical curtain wall application for a typical office in Melbourne, Australia.